Germany's longest serving post-war leader Helmut Kohl, the father of national reunification and an architect of European integration, died Friday at the age of 87. Kohl helped a Germany that was split during the Cold War between a capitalist west and a communist east make the traumatic transition to a unified democracy. The towering figure of European contemporary history also worked with France's Francois Mitterrand to shape the European project and pushed Germans to part with their cherished Deutschmarks in favour of the single European currency, the euro. German Chancellor Angela Merkel gave a moving tribute to her mentor, declaring that "Kohl changed my life decisively". Merkel, who grew up in the communist German Democratic Republic, said that thanks to him, she, "like millions of other people, could leave a life of GDR dictatorship and enter into a life of freedom". "All that has happened in the past 27 years from then until today would have been unimaginable without Helmut Kohl," said Merkel, dressed in black. 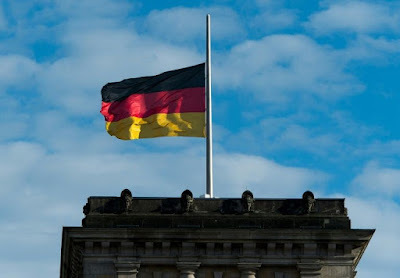 "It will be a while before we will truly be able to measure what we have lost with his passing," Merkel said, adding that she was "personally thankful that he was there". "I bow down before his memory," said Merkel, who described Kohl as a "great German and great European". Tributes also poured in from abroad, with former US president George H.W. Bush hailing "one of the greatest" post-war leaders, and European Commission chief Jean-Claude Juncker honouring him as the "very essence of Europe". Former Soviet leader Mikhail Gorbachev underlined Kohl's role in ending the Cold War, noting that "he was without doubt an exceptional personality who left his mark on German, European and international history". 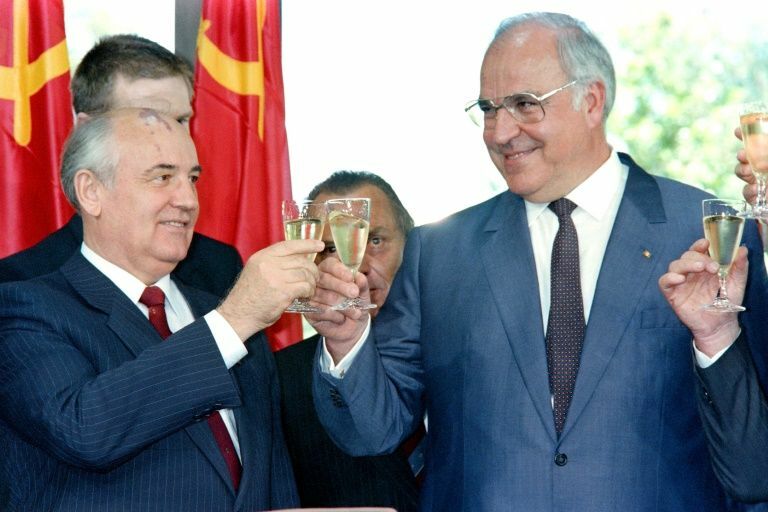 Kohl, Gorbachev said, had demonstrated "a deep interest for Russia" and had helped bridged East and West as he "warned the West against taking on a contemptuous attitude towards Russian interests". Kohl died peacefully in his bed at home in Ludwigshafen, in the southwestern state of Rhineland-Palatinate, said the Bild newspaper, adding that his wife Maike Kohl-Richter was by his side. Mourning his mentor and friend, Juncker said: "Helmut Kohl filled the European house with life -- not only because he built bridges to the west as well as to the east, but also because he never ceased to design even better blueprints for the future of Europe." Bush, describing Kohl as "a true friend of freedom", said: "Helmut hated war -- but he detested totalitarianism even more". "Working closely with my very good friend to help achieve a peaceful end to the Cold War and the unification of Germany within NATO will remain one of the great joys of my life," added the former US president. 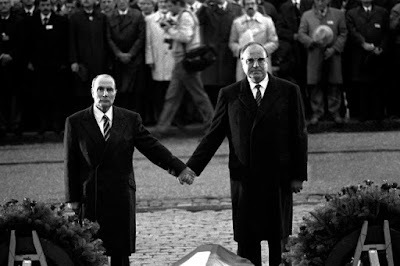 France's President Emmanuel Macron posted on Twitter a picture of Kohl standing with the late Mitterrand, saying: "An architect of united Germany and Franco-German friendship: with Helmut Kohl, we have lost a great European." Born into a Catholic family on April 3, 1930 in the industrial city of Ludwigshafen, Kohl studied history and political science and rose quickly through the conservative Christian Democratic Union (CDU) party, his ever-smiling first wife Hannelore, with whom he had two sons, by his side. He became chancellor of West Germany in 1982 and as the Cold War ended with the Berlin Wall coming down in November 1989, he moved to "grab the mantle of history," as he later said, forging a political stature commensurate with his towering height. Kohl persuaded Bush to accept a larger, reunified Germany, and convinced Gorbachev to withdraw troops from East Germany. His vision was for a reunified Germany that was at the heart of an enlarged European Union and a staunch NATO member. Merkel lauded his contribution to German and European integration in 2012, on the 30th anniversary of his becoming chancellor, declaring that Europeans were "united in our luck" thanks to Kohl's efforts. Kohl considered Konrad Adenauer -- West Germany's visionary first chancellor, who allowed the nation to make a fresh start after World War II -- as an ideological forefather. Mentor to Merkel, Kohl was later ousted by his protege, who urged their party to drop the self-declared "old warhorse" when he became embroiled in a campaign finance scandal in 1999.